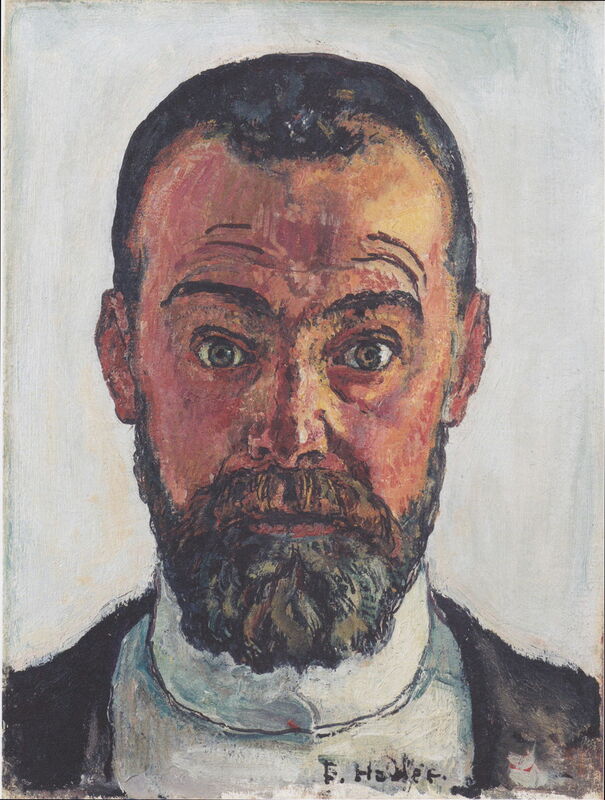 Ferdinand Hodler (1853–1918), Self-portrait (1912), oil on canvas, 33.5 × 27 cm, Kunstmuseum Winterthur, Winterthur, Switzerland. Wikimedia Commons. In the period to 1910, Hodler’s style had loosened and his paintings, landscapes in particular, eliminated detail to present simplified and stylised images, in what Hodler considered “a magnified, simplified nature, freed from all irrelevant details”. 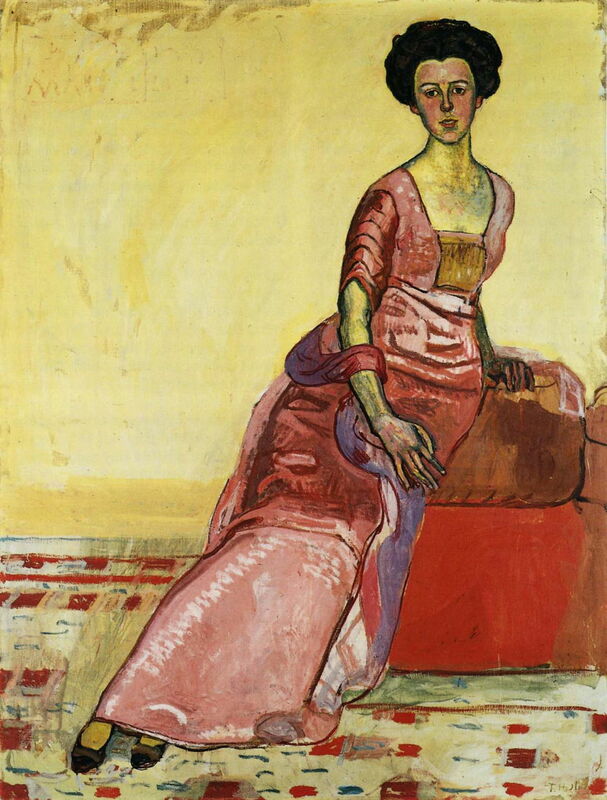 Ferdinand Hodler (1853–1918), Portrait of Gertrud Müller (1911), oil on canvas, 175 x 132 cm, Kunstmuseum Solothurn, Solothurn, Switzerland. Wikimedia Commons. 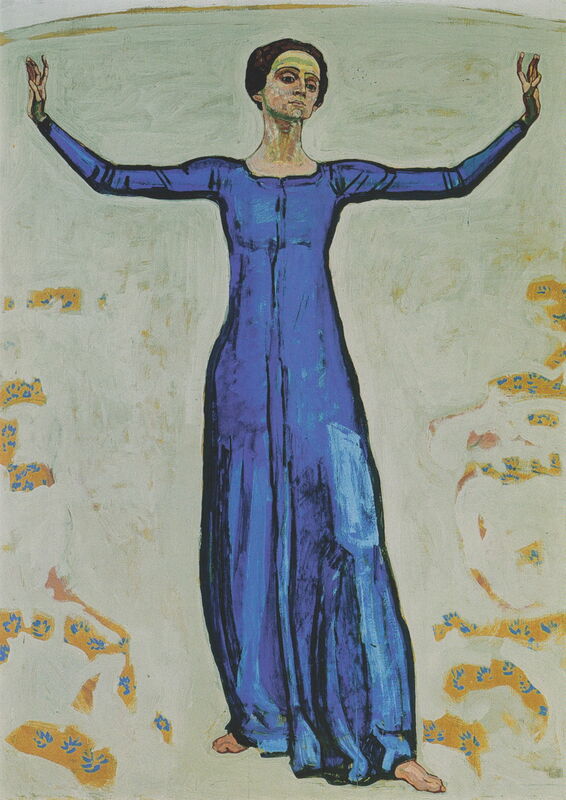 Hodler was close friends with Gertrud Dübi-Müller, the daughter of a family of industrialists from Solothurn in Switzerland, who was an important art collector and patron. In 1911, he painted this full-length Portrait of Gertrud Müller, which shows the influence that Gustav Klimt’s portraits had over his late style. Hodler, though, avoided the flamboyance of gold leaf, and lacks Klimt’s dense decorative embellishment. 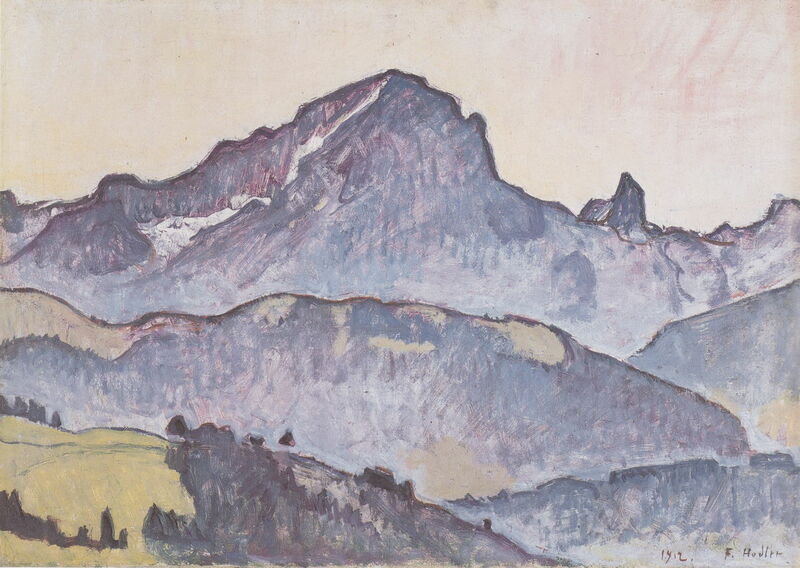 Dübi-Müller and Hodler spent the winter of 1911-12 together in Grindelwald, during which time he painted en plein air by the Upper Grindelwald Glacier. She was an avid photographer, and took more than 100 photos of Hodler at work in his studio, and many of him at leisure too. Ferdinand Hodler (1853–1918), The Breithorn (1911), oil on canvas, 70 x 77 cm, Kunstmuseum, St. Gallen, Switzerland. Wikimedia Commons. Hodler’s painting of The Breithorn of 1911 is unusual for the dominance of its almost cloudless sky, and lack of symmetry and rhythm. This mountain is in the Pennine Alps, on the border between Switzerland and Italy, and rises to a peak of 4,164 metres (13,661 feet). 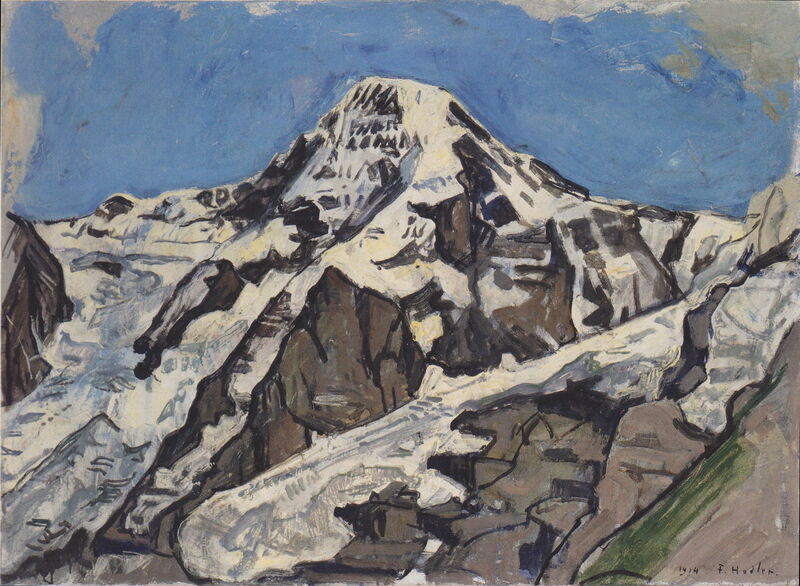 It is accessible from Zermatt in Switzerland, which was presumably Hodler’s base when painting the mountain. In 1912, Hodler painted four self-portraits for the collector Theodor Reinhart. I believe that this, probably his best-known Self-portrait, is among that group. In the Spring of 1912, Hodler rented an additional studio in Geneva to support his work on large murals, including that for the new town hall in Hanover, Germany, which he completed just over a year later. In early 1913, he was made an officer of the Swiss Legion of Honour. Ferdinand Hodler (1853–1918), Einmütigkeit (Unanimity) (c 1913), oil on canvas, 53.5 × 163.5 cm, Private collection. Wikimedia Commons. In 1911, Hodler had been commissioned by the city director of Hanover, Heinrich Tramm, to paint a very large mural in the city’s new town hall, a work which kept him occupied for a lot of the period until its completion in 1913. This small-scale study for Einmütigkeit Unanimity must have been painted in 1912-13, and gives a clear idea of the finished work. Emil Orlík shows Hodler at work on the mural during the summer of 1913 in this pastel. 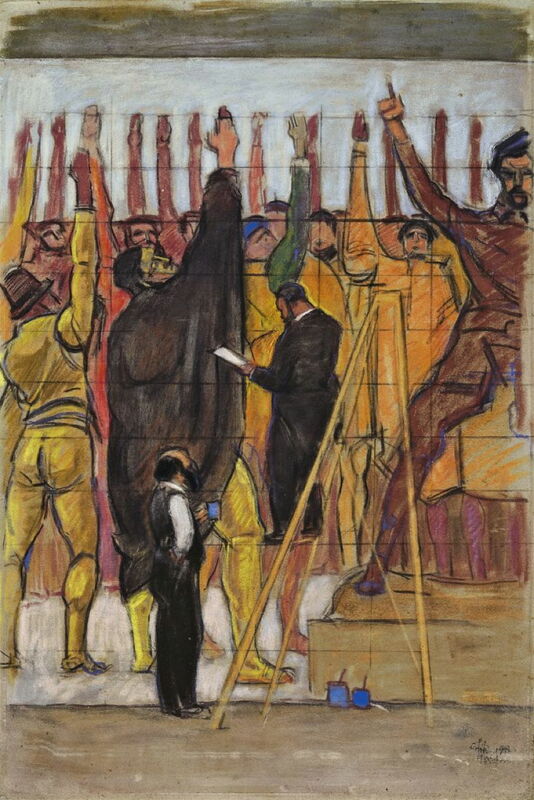 Ferdinand Hodler (1853–1918), Einmütigkeit (Unanimity) (1913), mural, dimensions not known, Neue Rathaus, Hannover, Germany. Image by Bernd Schwabe, via Wikimedia Commons. Remarkably, Hodler’s completed mural has survived the adverse criticism of the day, the Nazi regime, and the bombing of the city of Hanover during the Second World War. At its centre is the figure of Dietrich Arnsborg (1475-1558), who on 26 June 1533 brought together an assembly of the (male) citizens of Hanover in its market square, by the old town hall. Together they swore to adhere to the new Reformation doctrine of Martin Luther, as shown here in their unanimous raising of right hands. In the autumn of that year (1913), Hodler’s lover Valentine Godé-Darel gave birth to the couple’s first child, a daughter. Hodler continued to live with his wife Berthe, though, and later in the year they moved into a luxurious apartment in Geneva. Ferdinand Hodler (1853–1918), Le Grand Muveran from Villars (1912), oil on canvas, 53 × 75 cm, Von-der-Heydt-Museum, Wuppertal, Germany. Wikimedia Commons. Hodler had continued to paint landscapes throughout the period that he had been working on his Hanover mural and other large commissioned works. Le Grand Muveran from Villars, painted in the Bernese Alps in 1912, shows this peak which is just over 3,000 metres (10,000 feet) in height. It is to the south-east of Lake Geneva, overlooking the Rhone valley, and among some of the distant peaks seen in his views over the lake. Ferdinand Hodler (1853–1918), The Song From Afar (1913), oil on canvas, 180 × 129 cm, Kunsthaus Zürich, Zürich, Switzerland. Wikimedia Commons. The Song From Afar is the 1913 version of his 1906 painting, showing a woman walking alone through the alpine meadows. This is further simplified, with a sparse background and heavily-outlined figure. Her arms are in an almost identical position to those in the earlier version. 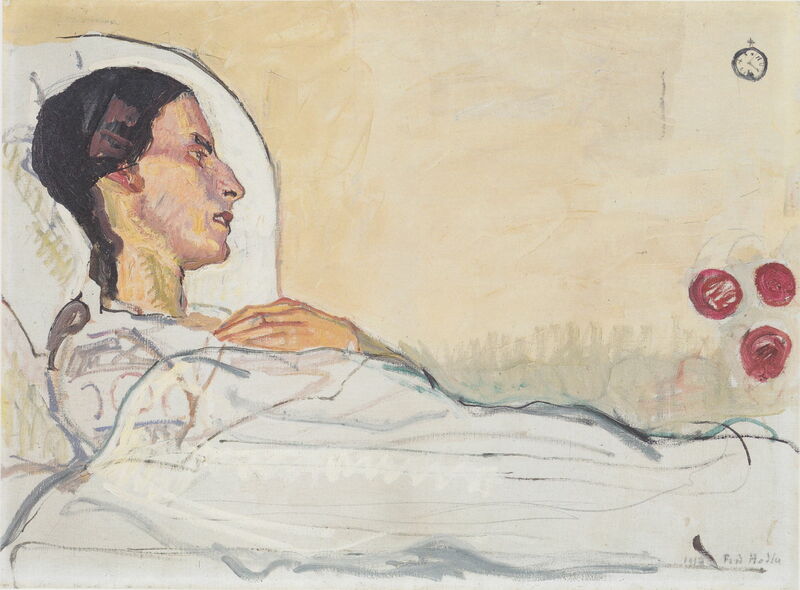 Ferdinand Hodler (1853–1918), Valentine Godé-Darel in her Sick-Bed (1914), oil on canvas, 63 × 86 cm, Kunstmuseum Solothurn, Solothurn, Switzerland. Wikimedia Commons. By 1914, personal tragedy had started to overtake Hodler. His lover had been diagnosed as suffering from cancer, and from then until her death the following year, Hodler was driven to draw and paint the progression of her illness. Already, as shown in his painting of Valentine Godé-Darel in her Sick-Bed from 1914, she was largely confined to bed by her cachexia. Ferdinand Hodler (1853–1918), The Mönch (1914), oil on canvas, 63 x 86 cm, Kunstmuseum Olten, Olten, Switzerland. Wikimedia Commons. 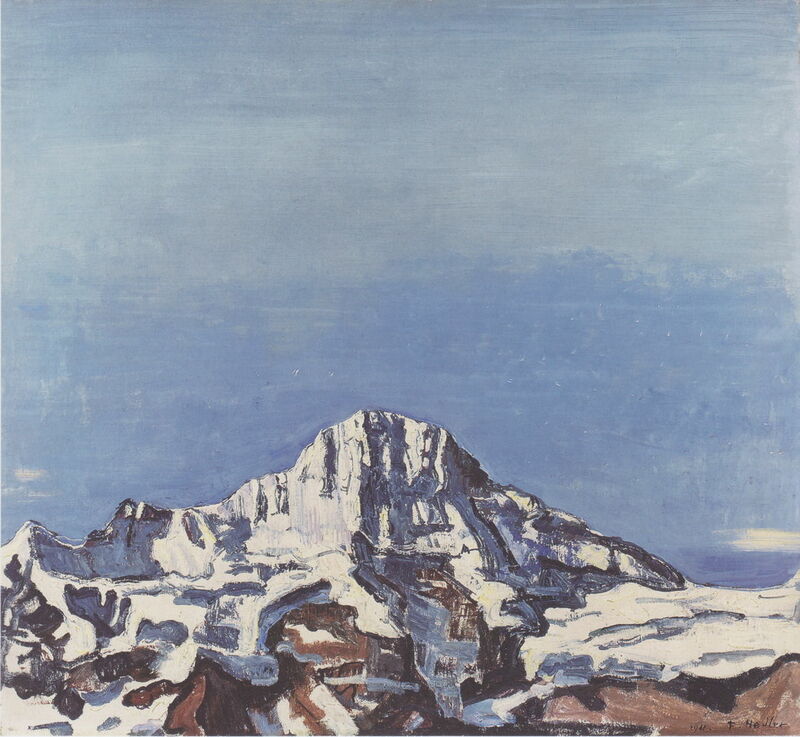 That same year, Hodler painted this portrait of The Mönch, which sits between the Eiger and the Jungfrau in the Bernese Alps, rising to a summit of 4107 metres (13,474 feet). Even in these great mountains, though, there had been change: in 1912, this peak had been pierced by the long tunnel carrying the Jungfrau Railway through its rock. Hodler, and the whole of Europe, was moving to a darker place. For the artist, Valentine Godé-Darel’s rapid deterioration could only bring more grief, as Europe entered the First World War. When German forces directed their heavy artillery fire at the French city of Reims, all but destroying its cathedral and setting the city alight, Hodler was among those to speak out in public. He was criticised for doing so, and many German galleries retaliated by excluding his work. Posted in General, Life, Painting and tagged Hodler, Klimt, landscape, Orlík, painting, parallelism, realism, symbolism. Bookmark the permalink.